Bake Off’s back! That’d be The Great British Bake Off, airing over there in Merrie Olde on BBC One. I watch it here in Southern California through VPN magick. If you’ve seen the show on PBS, unfortunately re-titled The Great British Baking Show, apparently due to Pillsbury having a trademark lock on “Bake Off,” you’ve seen the tip of the iceberg. And it’ll be a long, cold day indeed before they let you see more—was the same situation with Downton Abbey that spurred me to seek out an alternative. Aren’t the days long past when television networks get to dictate when we consume television? Rhetorical question, but the sort of rhetorical that happens to have an answer, and that answer is YES. So, if you’re in a non-BBC place, and plan to try to watch this season of GBBO when—maybe if, think about that!—PBS deigns to show it, you might want to give my recaps a miss, even though as in-fact recaps they’ll leave something to be desired. Of course this will be to your detriment, but as free men and women it is your right to decide and we shan’t speak of this further. I happen to be the sort of person that has no problem with spoilers of any stripe no matter the show. Maybe there are a few more out there like me. In which case, welcome. And let’s get to the bakes. But firstly: Meet the Bakers, if you haven’t previously. Place your early-bird wagers now; announce your predictions; keep your secret crushes to yourselves. Episode 1: Cake Week! My favorite week, unless you count Bread Week, upcoming—biscuit week is immediately next, howevah. 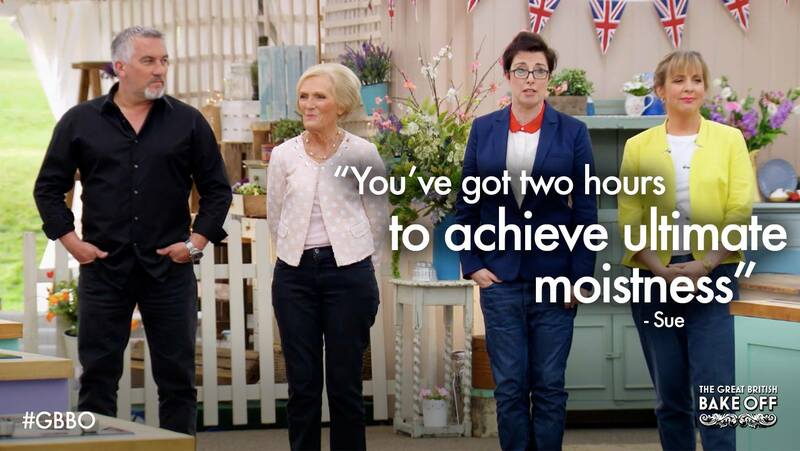 The sig bake was the very British, and I can only imagine before long the world’s, drizzle cake. Sponges of various shapes, poked and soaked. Then, for the tech bake, Mary Berry charged the bakers with jaffa cakes, the beloved packaged treat that probably most of us picture being manufactured entirely untouched by human hands. Not so, here in The Tent. In The Tent, jaffa cakes are artisanal. The showstopper is, truth be told, my least-favorite event. I am sure I am quite in the minority with this view, and that’s OK with me. Occasionally we get something really fantastic in this segment, like the bread lion face, lion bread face, from contestant Paul last season. The mirror-finish cakes of this first episode were not bad at all, blessedly lacking the over-the-topness that’s usually what puts me off more outlandish assemblages. The problem with several was they also lacked a, you know, mirror finish. A couple looked nomworthy, though, and having to no one’s surprise affable banker Selasi’s won the category. Jane was made Star Baker, and the token Old White Guy was sent home. A shame, he seemed nice, but do you hear the world-wide brain scream? For God’s sake how in the world did he make it into The Tent with those subpar skills? Bye-bye, ta very much, see you on An Extra Slice. An Extra Slice is a bonus not only for the dismissed baker of the week, but also for viewers, as we get to retread the episode just past with acerbic yet sympathetic Jo Brand and guests, often comedians or chefs. Both are good, but most days I’ll take the comedians. The charming Josh Widdicombe was very funny last season, for instance—hope we see him again. 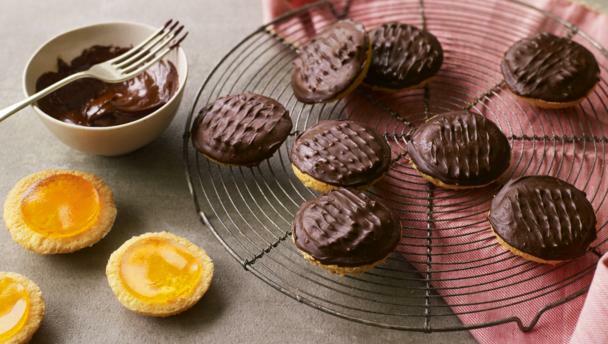 Here’s the recipe for Mary Berry’s Jaffa Cakes. See if you can’t get them right-way-up, with a thin disc of orange gelée perfectly napped in hash-marked choccy, just like they emerge from the McVitie’s factory.